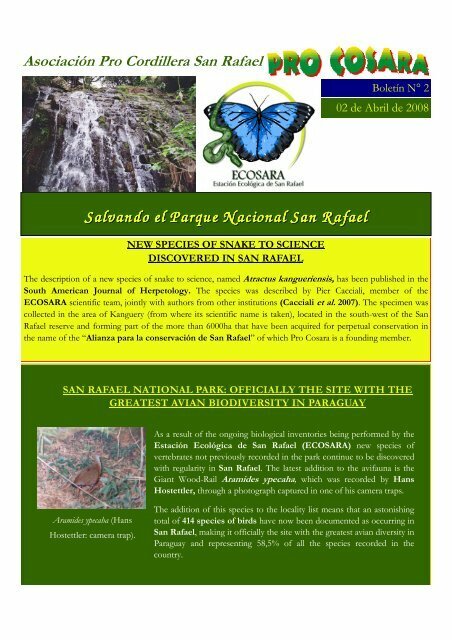 Asociación Pro Cordillera San Rafael Salvando Salvando Salvando Salvando el el el el Parque Parque Parque Parque N N N N acional acional acional acional San San San San R R R R afael afael afael afael NEW SPECIES OF SNAKE TO SCIENCE DISCOVERED IN SAN RAFAEL Boletín N° 2 02 de Abril de 2008 The description of a new species of snake to science, named Atractus kangueriensis, has been published in the South American Journal of Herpetology.  The species was described by Pier Cacciali, member of the ECOSARA scientific team, jointly with authors from other institutions (Cacciali et al. 2007). The specimen was collected in the area of Kanguery (from where its scientific name is taken), located in the south-west of the San Rafael reserve and forming part of the more than 6000ha that have been acquired for perpetual conservation in the name of the “Alianza para la conservación de San Rafael” of which Pro Cosara is a founding member. SAN RAFAEL NATIONAL PARK: OFFICIALLY THE SITE WITH THE GREATEST AVIAN BIODIVERSITY IN PARAGUAY Aramides ypecaha (Hans Hostettler: camera trap). As a result of the ongoing biological inventories being performed by the Estación Ecológica de San Rafael (ECOSARA) new species of vertebrates not previously recorded in the park continue to be discovered with regularity in San Rafael. The latest addition to the avifauna is the Giant Wood-Rail Aramides ypecaha, which was recorded by Hans Hostettler, through a photograph captured in one of his camera traps. The addition of this species to the locality list means that an astonishing total of 414 species of birds have now been documented as occurring in San Rafael, making it officially the site with the greatest avian diversity in Paraguay and representing 58,5% of all the species recorded in the country.